No Fenders -Formula 1, IndyCar and A Whole lot more..: El Soundero! Crossing over the King Street Station railroad tracks and down the stairway towards QWest Field, I was immediately struck by the ambiance of the crowd already salivating in anticipation of the upcoming match as Randal informed me that the Sounders FC Band was playing the theme song of the original NASL Sounders along with the teams new fight song as there was a definite buzz outside of the Stadium, as I stopped for an “action” shot in front of Qwest Field. Over the din of the Pre-game banter, apparently Randal misheard my question as I asked him if the Sounders FC player the PA Announcer had just mentioned was a Forward? To which Randal replied: NO! He’s Black! Which caused me to break out in laughter as I was actually inquiring about Forward Steve Zakuani, whom Randal had thought I’d asked; is he Polish? And then it was time for the singing of the “Kuh-Naidiun” and American National Anthems… “Oh Canada!” As we simply remained standing as it was time for kickoff… As I still cannot get over the fact that everyone in the Stadium STANDS for the entire 90mins. GO SOUNDERS FC! Even more impressive was the voracious cheering of what I quickly nicknamed “Keller’s Crew,” referring to the Rabid fans behind what is typically Sounders FC goal keeper Kasey Keller’s box during the first half of the match, as this section would be responsible for leading ALL of the chants for the entire match… Starting off with SEATTLE as the other half of the Stadium responded with SOUNDERS! As the Fans tried to excite our Homeboys who got off to a very shaky start and shoulda literally been behind 3-0; SHEISA! Thus it was even more entertaining to hear “Keller’s Crew” chant: The Ref is a WANKER! The Ref is a WANKER! The Ref is a WANKER! As the Rabid Fans shouted their objections on questionable calls, sloppy play and handed out numerous “Air Cards,” when they thought a Yellow Card was required… As I kept mentioning to Randal how amazing the crowd’s exuberance was and how hilarious I found the sanctioning of the air-Cards to be... Whilst waiting Randal pointing out my favourite Sounders FC player: (#19) Leonardo Gonzalez; Left Fullback, as I was impressed by the Costa Rican’s *Gonzalez) willingness to come to a Foreign country and play his heart out for the Major” football league in order to get a chance at playing full time professionally… Oh, what’s that Randal? He’s really good you say? No Kidding? COOL! And towards the middle of the second half, we began screaming BOO! BOO! BBBOOOOOOOOOOOOOO!!! Booing “Del Rio” every time Toronto FC Striker Wayne Del Rosario got his boots upon the soccer ball, since apparently he’s one of Toronto’s major threats… While we also chanted Eh! Eh! Eh! Eh! Eh! Eh! Several times during the match, which although was disappointing to end in a zero-zero draw, at least it was somewhat better then an outright loss, eh? And thus it seemed simply overwhelming that the entire 32,679 in Attendance (the ENTIRE Season is SOLD OUT!) stood gleefully thru the entire match, including the extra five minutes added for stoppage as we made our exit from the Raucous Qwest Stadium, where the 2009 MLS Expansion Sounders FC club are in quest of making the playoffs in their very first Major League Soccer season. PlayoffsThe Sounders became only the second ever MLS Expansion Team to make the Playoffs in their inaugural season, the feat having not occurred since the 1998 Chicago Fire went all the way to the finals and won the title. Thus in their playoff grouping, the sounders hosted the Houston Dynamo in round 1 of a two game playoff match, with the first game being held at Qwest Field, where a Record 35,807 Fans attended the Sellout match that ended in a 0-0 draw. Thus on November 8th a all or nothing Game Two was held on Houston’s home turf, where the top two defensive Teams in the League played another ninety scoreless minutes, with the two squads having completed a total of 180 minutes without a single goal having been scored! Ironically Brian Ching played his collegiate Soccer at Eastern Washington’s Gonzaga University, where he scored 34 goals for the Bulldogs before playing for the Spokane Shadow prior to being drafted by the LA Galaxy and then playing a short stint with the Seattle Sounders “A” League Team before returning to MLS action fulltime. And this year’s Major League Soccer Championship Final, the MLS Cup was held at Qwest Field with a very impressive 41,000+ Fans attending, where some locals could be heard silently chanting Beat LA! And thus, I was absolutely thrilled to discover upon my return from Canada that Real Salt Lake had indeed defeated Messer Beckem & Donovan’s Galaxy in a sudden death shoot-out! Yet the Sounders can be quite proud of their inaugural MLS campaign, having won the Lamar Hunt U.S. Open Cup, along with Goalkeeper Kasey Keller and midfielder Freddie Ljungberg being named to the MLS All Star Team, while Forward Fredy Montero Beat out teammates Keller & Ljungberg for the MLS’s Newcomer of the Year Award. The Sounders FC Team had a total of five members nominated for MLS Yearend Awards, with the three above and central defender Jhon Kennedy Hurtado plus Coach Sigi Schmid. 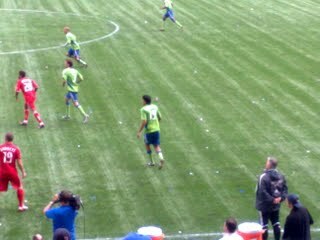 GO SOUNDERS FC and Kudos Randal!